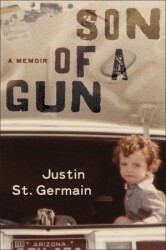 Thanks to TLC Book Tours, we're pleased to present a review for Son of a Gun, a new memoir by Justin St. Germain. Make sure to check out the rest of the tour stops to see other reviews! In the tradition of Tobias Wolff, James Ellroy, and Mary Karr, a stunning memoir of a mother-son relationship that is also the searing, unflinching account of a murder and its aftermath. Long after his mother’s death is “solved,” closure still seems missing. Distancing himself from the legendary town of his childhood, Justin makes another life a world away in San Francisco and achieves all the surface successes that would have filled his mother with pride. Yet years later he’s still sleeping with a loaded rifle under his bed. Ultimately, he is pulled back to the desert landscape of his childhood on a search to make sense of the unfathomable. What made his mother, a onetime army paratrooper, the type of woman who would stand up to any man except the men she was in love with? What led her to move from place to place, house to house, man to man, job to job, until finally she found herself in a desperate and deteriorating situation, living on an isolated patch of desert with an unstable ex-cop? Justin’s journey takes him back to the ghost town of Wyatt Earp and the Gunfight at the O.K. Corral, to the trailers he and Debbie shared, to the string of stepfathers who were a constant, sometimes threatening presence in his life, to a harsh world on the margins full of men and women all struggling to define what family means. He decides to confront people from his past and delve into the police records in an attempt to make sense of his mother’s life and death. All the while he tries to be the type of man she would have wanted him to be. Son of a Gun is an unflinchingly honest memoir as author Justin St. Germain looks back at his mother Debbie's murder by her husband, and goes back to trace her life beforehand, and afterwards. The story of Debbie's life and death is intertwined with Justin's own search for answers, and a little bit of Old West history, while he's at it. Debbie's life wasn't easy, and she wasn't perfect, but St. Germain never blames her, and in fact expresses anger that people would blame anyone other than the man who pulled the trigger for killing her. Seeing victim blaming in books about crime is so common that it was a relief to read about the author's anger whenever people suggested that his mother should shoulder some of the blame in the circumstances that led to her death. I liked the fact that he examined this line of thinking, even addressing how it crept into his own thoughts, rather than just ignoring it. I was captivated start to finish by this book and St. Germain's heartfelt yet straight-forward manner of writing. He doesn't pull any punches in his writing and allows the reader access to his most personal thoughts while he was on this journey. I enjoy reading true crime stories, or should I say that I'm generally pretty morbidly fascinated by them, but I loved this book even more because it wasn't just a straight accounting of the circumstances that led to Debbie's murder. It's an introspective look at the author's own life and memories of his mother and his childhood. The whole story is, quite obviously, tinged in sadness and a bit of regret. He's searching for the truth about his mother, but has to face up to his own demons in the meantime: his anger, his fear, his own distorted memories. I feel like a lot of memoirs often want to skip over this part, but St. Germain is unafraid to put it all out there. This was a very heavy story to read at times, and with good reason. Deconstructing a person's life and the circumstances around a murder should never be an easy read. There are no quick answers, no real closure or justice in this case, no real answer as to "why". It really feels like writing this book was a growing experience for St. Germain, and I hope that he was able to use the writing experience as a way to better understand himself and to continue healing. Sound interesting? Want to read it? We're giving away one copy of the book to a lucky reader! If you have an address in the US or Canada, enter below for a chance to win. I'm not usually into memoirs, but this one sounds beautiful. This is the kind of book I most enjoy - I'm really looking forward to getting my hands on a copy!